Save the date for this annual celebration of mid-year graduates. Save the Date for the December Toast, the annual celebration of our mid-year graduates. The 2018 edition takes place Friday, Dec. 14, 4:30-6 p.m. at the Webster University Community Music School. This event will honor our August, October and December graduates from the greater St. Louis area. It will be an opportunity to join Webster administrators, faculty and staff to enjoy words of congratulations, refreshments, music and camaraderie with our graduates. 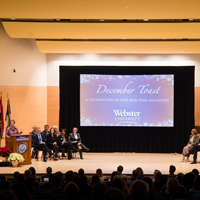 For more information on the December Toast and to RSVP, go to webster.edu/commencement/DecemberToast.